When Will Power Come Back To Puerto Rico? Depends Who You Ask These days, Puerto Rico's monumental power restoration effort involves helicopters dropping 100-foot towers into the mountains and a "big dance" of crews, equipment and expertise. Eric Elder, an Army reservist who came to Puerto Rico in early October to do power line work, says the work is challenging. "Every pole is different, every pole has to be looked at and dressed differently." Earlier this week, the island hit a goal of restoring 50 percent of its generating capacity, according to Gov. Ricardo Roselló. But hours later, a major transmission line failed, knocking out electricity to much of San Juan and reducing power generation on the island to just 22 percent. By Thursday, Puerto Rico was back up to 40 percent of its generating capacity. Getting the lights back on in Puerto Rico is a far more a intensive task compared with the mainland, which was able to restore power quickly after hurricanes hit Florida and Texas. Two months ago, Hurricane Maria's 150 mile-per-hour winds snapped concrete power poles and left power lines dangling on the island. And the hilly terrain means it takes longer to get material and crews to areas that need work. Eric Elder, who has been working in Puerto Rico as an Army reservist since early October, says it just takes longer to get material in compared with the mainland. Elder is part of the Delta 249 engineering battalion based in Cranston, R.I. and on this recent day, he was working in the hilly neighborhood of Rio Grande, a city east of San Juan. "There are lots of different challenges that we don't face on the mainland," he says. José Sánchez comes by to check on the crews working in Rio Grande. 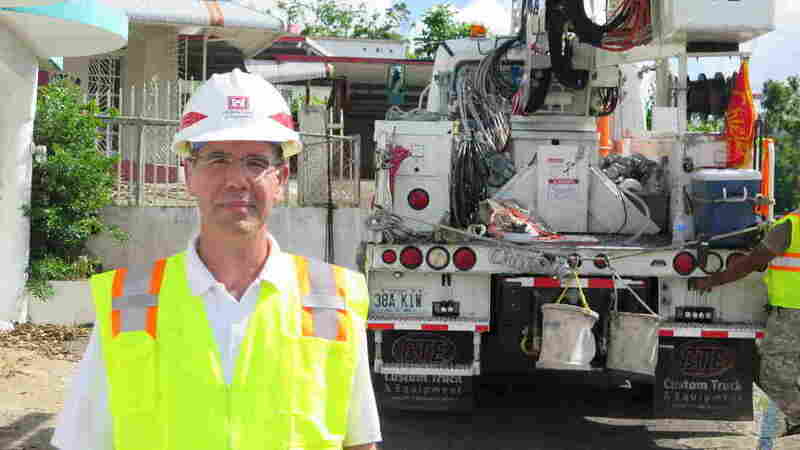 Sanchez heads local efforts to restore the power grid in Puerto Rico for the Army Corps of Engineers and has several hundred contractors working for him. He says this neighborhood's distribution lines — the network that takes power to individual homes and businesses — are nearly ready. But that doesn't necessarily mean their work is done. José Sánchez, who heads the Army Corps of Engineers efforts to restore the power grid in Puerto Rico, says the repair work is slowest is in the southeastern part of the island where Hurricane Maria made landfall. That's because of topography and limited materials, he says. "Demand is high and everything comes from the mainland." "The ones dropping to the homes — they all look good," he says, "the transformer looks good but obviously we won't really know until it's energized." Sánchez is in charge of just half of the power restoration effort here. The other half of the work being done elsewhere on the island is being managed by Puerto Rico's cash-strapped electric power company, PREPA. PREPA has some 2,000 people working to restore power on the island, including crews from Whitefish, the small Montana-company whose contract was cancelled recently amid controversy. In contrast, the Department of Energy estimates 60,000 workers from hundreds of public and private electric were deployed to restore power in Florida after Hurricane Irma hit, as NPR's Tim Webber reported. Sánchez says he meets daily with PREPA officials, "to determine the best location for the assets according to materials, expertise and equipment." He calls the operation in Puerto Rico "one big dance." 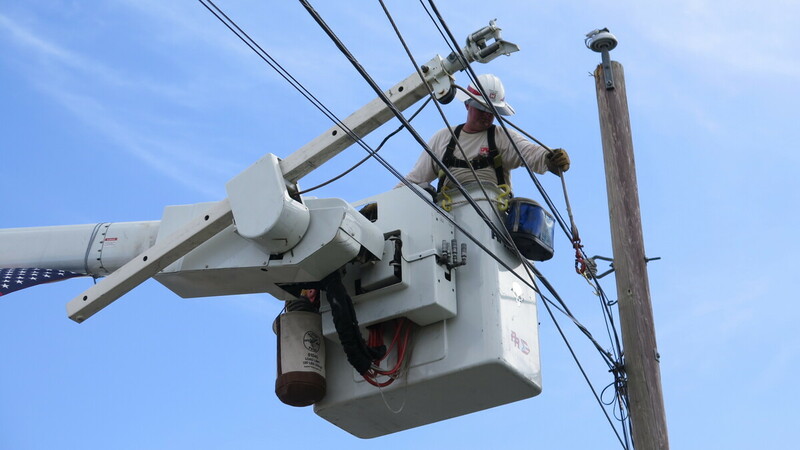 His toughest job is repairing high voltage transmission lines that connect power plants in the south with population centers on Puerto Rico's northern coast. His crews are working to replace steel towers over 100 feet tall in mountainous areas. "One tower would be brought in by helicopter" he says, and "personnel would be dropped by helicopter and their equipment in order to work at the site." Before the transmission line failure this week, Puerto Rico's government said utility crews had restored close to half of the island's generating capacity. But that didn't mean that half of the island had power. Power is being restored first to hospitals and critical industries and slowly restoration work is moving into neighborhoods like this one in Rio Grande. Work goes slowly. The topography of Puerto Rico is challenging and replacing a single tower, Sánchez says, can take up to a week. Sánchez is asked several times each day when the power will come back on, and he's hesitant to give a direct answer. "I don't know," he says, "I want to say a date but I don't want to be giving false hopes to people." But, he says 95 percent of the island should have power back by the end of February. Though restoring power for that last 5 percent — many of them scattered customers in remote areas — he says, may take much longer. PREPA has been more aggressive with its forecasts, estimating that 95 percent of the island's power will be back by mid-December. One of the many places people are still waiting for power is La Perla, an underprivileged community with one of the most beautiful views on the entire island. In this neighborhood chickens and pheasants roam freely. It's right on the ocean and on the skirts of El Morro, the 16th century citadel built to fight sea attacks in San Juan. 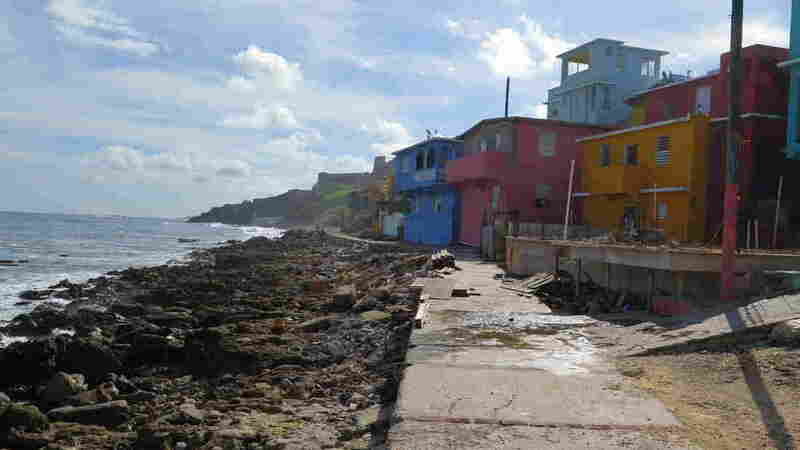 La Perla is an impoverished neighborhood with some of the most magnificent views on the island. La Perla is where Luis Fonsi and Daddy Yankee shot the music video for the summer hit song "Despacito," overlooking San Juan's rocky coastline. As NPR's Mandalit del Barco reported last month, many residents there felt forgotten by recovery efforts, and resorted to erecting signs reading "S.O.S., we need help. Water, provisions. Don't abandon us. Despacito." 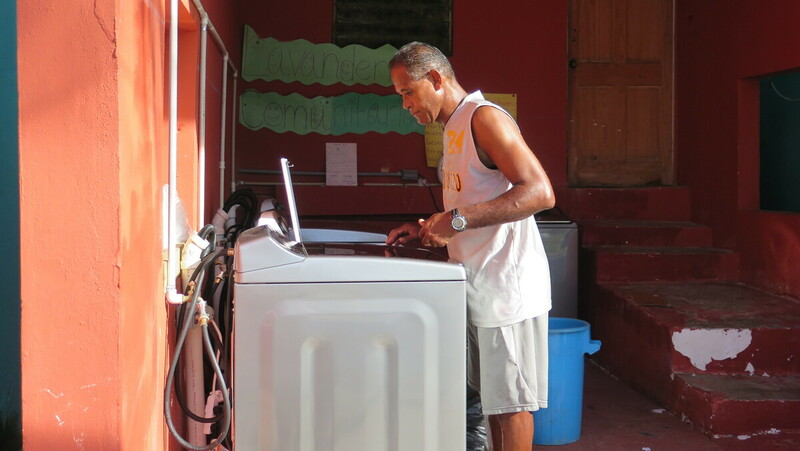 Although there's no power, La Perla has working washing machines in a community laundry area. They were installed recently for free by Sonnen, a German company that has been selling solar powered battery systems on the island since last year. Roberto "Coco" Viruet washes clothes in the community laundry room in La Perla. Viruet says it's been "too long" without power in his neighborhood. Five washing machines run off a solar powered micro-grid. "The battery provides a stable grid for whatever we're powering to operate on," says Adam Gentner with Sonnen. "And the solar then charges the batteries and operates the machinery during the day." These kind of micro-grid systems are becoming more popular here in Puerto Rico. They're not cheap, but on an island where even before the storm power was expensive and unreliable, Gentner believes micro-grids are part of the future. "There is now an opportunity going forward in Puerto Rico to build some resiliency into the grid," he says. He says that micro-grids with solar energy and battery storage are a must on the island because the "next time a big hurricane comes we won't lose the power lines again" and be down for 60 days. "It's really hard, very stressful to be without power for more than two months," says Wilfredo López, 56, of La Perla. He says he feels somewhat neglected by the government, but he's not angry. Throwing up his arms in the air, López says, "What else can we do? We can't pick up and gun and say 'Give me that or else.' We have to be patient." Neighbor Lucy Pacheco Rivera says she's happy they finally have a place to do laundry. "No more hand washing," she says. She didn't know of the micro-grid project until a few days ago, she says, but she's already used it to wash her clothes. Utility trucks showed up this week in La Perla, navigating the narrow, hilly streets and giving some people hope power will be back on soon. But, Pacheco Rivera is skeptical. "We're not sure now what we'll get first here in Puerto Rico," she says "power or statehood."